The federal government has told a Federal High Court sitting in Abuja why it is not in a hurry to release the detained leader of Indigenous People of Biafra, IPOB, Nnamdi Kanu. In a report on Vanguard, the FG claims that its investigations revealed that Kanu, who it identified as the brain behind recent clamour for the creation of ‘Biafra Republic’, had already received huge sums of money to purchase weapons. This was revealed in a counter-affidavit before the High court, as the FG alleged that prior to his arrest, Kanu had already made enquiries about prices of all the weapons he intends to buy and use against the nation. In the counter-affidavit by a senior officer with the Department of State Services (DSS), Ayo Ibitoye, the government insisted that it would be in the interest of justice, peace and order, to allow the IPOB leader to remain in custody of the security agency. 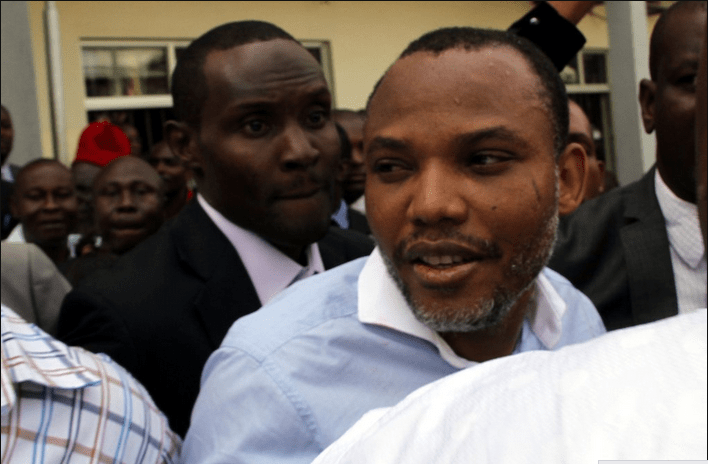 Kanu who is also the director of Radio Biafra and television, was on Saturday, October 17, arrested in Lagos by security operatives, shortly after he arrived Nigeria from his base in the United Kingdom.